In a very large youth hockey social media group I belong to, there's been a recent trend of folks feeling, well, like a lower class of hockey parent. As hockey parents from all over North America routinely comment (brag?) about which tournaments they're attending each weekend (when it's not even hockey season) or show off the expensive training gadgets they've purchased (Super Deker, I'm looking at you! ), it's totally understandable for other hockey parents who's kids have moved on to baseball or soccer season to feel, well, like they're not "part of the group." One comment that I recently read didn't tiptoe around anything and cut to the chase saying that it "felt like this was an A-Player only type of group," and asked, "Are there any B-Player groups out there?" And even though I hadn't participated in any of the conversations taking place -- I'm a lurker -- I knew exactly where that parent was coming from. I'm often criticized (ridiculed?) when it comes to youth hockey for having my kids play year round, take private lessons, overtly recruiting for elite teams my kids don't even play for, and overly praising elite program's coaching while having almost zero regard for the additional costs, travel, or time commitment that all of that requires. I will admit, I'm pretty gung-ho about youth hockey. Not like some of these parents that are clearly insane...but I'm pretty far up there. I should fit right in with that 'in' crowd though, right? But here's the thing that keeps me grounded and self aware...my son Duncan was a B-team player. I mean, so much so that he was an award winning B-level player. That's him in the picture after accepting his award. And that's not to brag or anything. I mean, I was really proud of him for winning that award, and still am cause it concisely defines exactly the type of player he is, but not for a second will I pretend that he brought that trophy home because he displayed unheralded talent on the ice as a 6 year old. He won that award cause he showed up, listened to the coaches, and tried hard all season long. All of that work earned him a single flukey goal. Twenty-eight half ice games and just one goal at the Mite B level. Fewest points on the team. I know what it's like, from a parent's perspective, to be on the bottom. In fact, Duncan, while he plays on an Elite team these days is *still* on the bottom. Guess how many goals he scored last season -- his second at the Elite level? Yep, lowest on the team...again. And while I'd love it if he could chip in more offensively, I'm totally fine with him being at the bottom of the depth chart. While no one is really noticing, as he skates way under the radar, he's getting better and better cause he's still that kid that shows up, listens to his coaches, and tries really hard. If he still played on a B-team, well, I'm sure he'd have a pretty substantial goal total by now...but I'm not sure he'd be a better player. Actually, I'm certain he'd be less of a player. 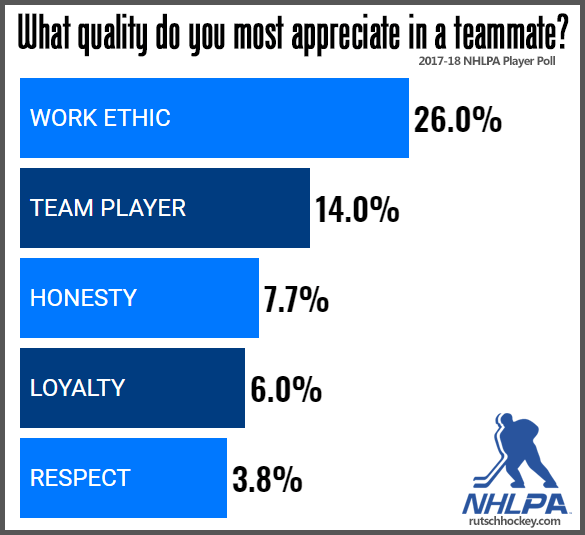 In the most recent NHLPA Player Poll, one of the questions every player was asked was "What quality do you most appreciate in a teammate?" The top 5 results, shocking to some, are in the graphic over there. Skill is impressive, yes, but work ethic is everything. A dedicated player who gives it his all day in and day out - and continuously strives to be better - is the most desired quality in an NHL teammate. The kid that scores a single goal per season. 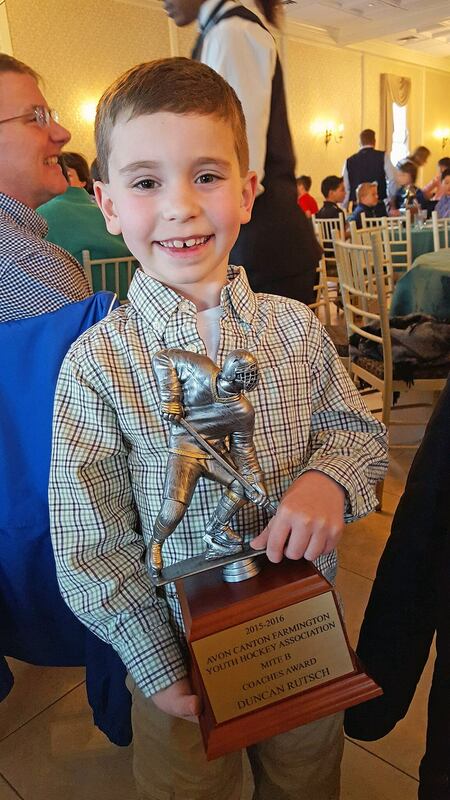 Extrapolating this all the way down to 8 year olds -- when my son's mite team held a secret vote for their two "End of Season" player awards...the winner for Most Valuable Player went to our hardest worker and the winner for Most Improved was the player whose efforts during the season completely changed their game. Neither was the leading scorer. Neither was on the top line. Kids as young as 8 years old don't see the game or their teammates much differently than the players in the NHL. And that's exactly why I don't want anyone to be intimidated by elite hockey thinking that their kid isn't good enough at that level of play. So, I've talked about the difference of elite hockey over and over. Like, is it really better? Yes, it is better but it's not all about the talent or skill level. No one is just born "good" at hockey. You have to be taught to be good at hockey. Sure, some people have a seemingly natural "knack" for things...but it's the players that work the hardest...that get the farthest. Maybe not as a 6 year old. Maybe not at 8, either. But if they stick with it, well, look out. The coaching is better at the elite level... just like a steak house has better meat than McDonalds. It's just the way it is. I mean, I've yet to encounter an elite team whose coach is just coaching because their son or daughter plays on the team. Now, you know your own children better than anyone -- if they're the type that works hard and wants to get better, they will THRIVE in an elite program ... regardless of their current talent or skill level. And if they're blessed with talent and have the work ethic too, well, look out, they're going to excel so fast and make all of their teammates better at the same time. Seen it firsthand and it's unbelievable. And, really, the best coaches also value the hardest workers. It's a win/win. At the youth level, it shouldn't be about how many wins your team receives -- bad coaches will hide behind the talent on their team. The best coaches are fulfilled moreso by how much better their players get as a result of their coaching and, outside of a single team we've faced, this rings true across all elite programs. It's more fun to watch a team get better and better and better. That, right there, is a great reason to consider jumping up a level...or five.